This site showcases some of the paintings I have produced in the last 20 years. All paintings are watercolor/acrylic on paper and available pieces are marked [Available]. Clicking on any painting will display a larger image, along with information about the piece. For some thoughts on my art and process, see my Artist Statement. Every Autumn, to mark the changing of the season, I create a painting that involves autumn leaves. 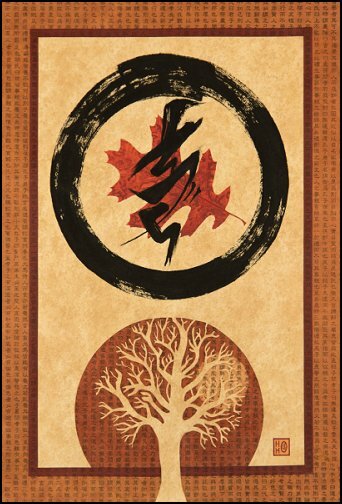 In "Autumn Moon", the leaf image in the upper center was formed by pressing a real leaf into wet acrylic paint, allowing it to dry in place, then removing the leaf, leaving its impression. The calligraphic mark overlaying it is something that came from my imagination, it does not represent a character in any known language. The tree at the bottom is a negative space cut out from rice paper with commercially printed characters that I tinted and collaged. The border is a collage of the same rice paper.